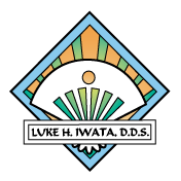 Dr. Iwata is proud to be a LVI trained dentist, having received specialized training in cosmetic dentistry from the renowned Las Vegas Institute for Advanced Dental Training. Committed to excellence, LVI is the largest post-doctoral dental training facility that brings in only expert instructors to train dentists from all over the world. As part of its goal of helping dentists master innovative dental procedures and techniques, LVI provides vital hands-on clinical training. The LVI philosophy is simple – combine art and dental excellence to provide patient-focused aesthetic dentistry. When providing treatment, LVI-trained dentists take into account more than just the patient's teeth and gums – they also assess facial shape, jaw joints, and overall health. In addition, LVI-trained dentists are progressive and hold themselves to a higher standard of care. Dr. Iwata provides dental solutions using the latest cosmetic dental techniques and technology to help his patients achieve beautiful smiles.